Weierstrass-Stone Theorem and Generalisations - A Brief Survey. Weierstrass-Stone Theorem. Closure of a Module - The Weighted Approximation Problem. Criteria of Localisability. A Differentiable Variant of the Stone-Weierstrass Theorem. Further Differentiable Variants of the Stone-Weierstrass Theorem. Strong Approximation in Finite-Dimensional Spaces. H. Whitney's Theorem on Analytic Approximation. C∞- Approximation in a Finite-Dimensional Space. Strong Approximation in Infinite-Dimensional Spaces. Kurzweil's Theorems on Analytic Approximation. Smoothness Properties of Norms in Lp-Spaces. C∞-Partitions of Unity in Hilbert Space. Theorem of Bonic and Frampton. Smale's Theorem. Theorem of Eells and McAlpin. Contributions of J. Wells and K. Sundaresan. Theorems of Desolneux-Moulis. Ck-Approximation of Ck by C∞ - A Theorem of Heble. Connection Between Strong Approximation and Earlier Ideas of Bernstein-Nachbin. Strong Approximation - Other Directions. Differential Calculus in Banach Spaces. This is an exposition of some special results on analytic or C∞-approximation of functions in the strong sense, in finite- and infinite-dimensional spaces. It starts with H. Whitney's theorem on strong approximation by analytic functions in finite-dimensional spaces and ends with some recent results by the author on strong C∞-approximation of functions defined in a separable Hilbert space. 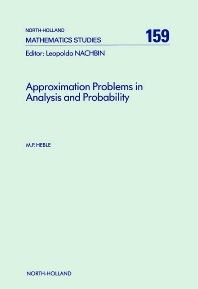 The volume also contains some special results on approximation of stochastic processes. The results explained in the book have been obtained over a span of nearly five decades.